Imposter syndrome may not be a familiar term for you, but I can guarantee it is something you and most everyone you know has experienced, especially the outwardly appearing “successful” people. Imposter syndrome (a term coined in 1978 by psychologists Pauline Clance and Suzanne Imes) describes a concept where individuals are not able to embody their accomplishments and instead have a persistent fear of being exposed as a “fraud”. Despite external accolades and evidence of competency, those experiencing imposter syndrome embody a belief that they are imposters and feel unworthy of the success they have achieved. When I commenced my first university degree, a family member inquired if I was actually going to complete a degree or just get a diploma. She cited to me, “not everyone is cut out to get a degree”. While it is reasonable to assume she may have consciously or even unconsciously wanted to shake my self-confidence (see my blog on projection for more on this: https://blacksheepcounselling.com/2017/08/projection/), when I started (and continued) to get top marks, a part of me questioned whether the professors marking my papers had made a mistake! This is a perfect example of Imposter Syndrome. What contributed to this was the message I received in early life around the concepts of intellect and academia, thus causing me to define myself as “creative” – something I internalized to be on the opposite end of the “smarts” spectrum. 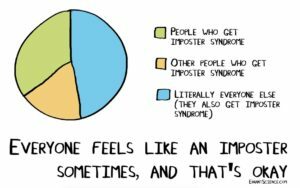 What Does Imposter Syndrome Look Like? Stop “shoulding” all over yourself. It’s easy to get caught up trying to live up to other peoples’ ideals and expectations. Clarify your own value and belief systems and allow them to become the measure on which you live your own sense of truth and integrity. Mentor someone. Mentoring or tutoring someone can help reality-check how far you have come in your accomplishments and how much wisdom and insight you have accumulated. Embrace Imperfection! We are all “works-in-progress”; this is part of our shared humanity. We are meant to feel a wide array of emotions and experience failures as well as successes. Without having experienced sadness, we would never truly appreciate happiness and joy. Without failures, we could never achieve successes.